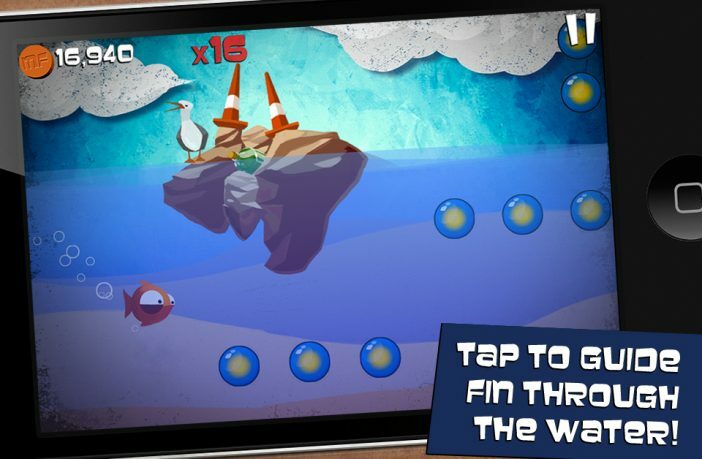 Mighty Fin by Launching Pad Games is all about the holiday adventures of Fin, a fish with a fondness for fancy dress. Unfortunately, Fin is very price-conscious, so he’s opted for an inexpensive trip around the world with a shady character called, suitably, Shady Sal. Clearly not good at recognising foreboding names, Fin has failed to realise that cheap can be potentially fatal when it comes to holidays. Nothing shouts ‘holiday adventure’ more than a dip in the shark-infested waters of Shipwreck Strait, right? Your task is to guide Fin through the various waters of the world as he athletically dodges danger. As you swim, you can collect bubbles to help you to rack up points; quickly swimming through several bubbles consecutively builds your point multiplier. You see the action from a 2D perspective. 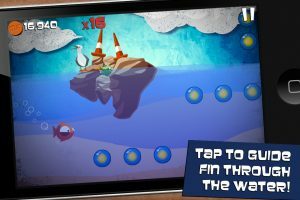 Touching the screen makes Fin dive and letting go causes him to leap from the water with all the flair of a dolphin wearing sunglasses. There are eight gradually more difficult levels to navigate through, and completing a level unlocks ‘endless’ and ‘survival’ modes for that level. Endless mode is just a point-building slog through the level until you eventually die, and would be far more entertaining if the level got more difficult as you progressed through it. As it is, if you start off by finding a level easy, it’s likely to still seem that way five minutes later. Survival mode is much more fun. The speed that Fin swims at gradually increases, so you need to respond to danger more and more quickly if you want to stay alive. 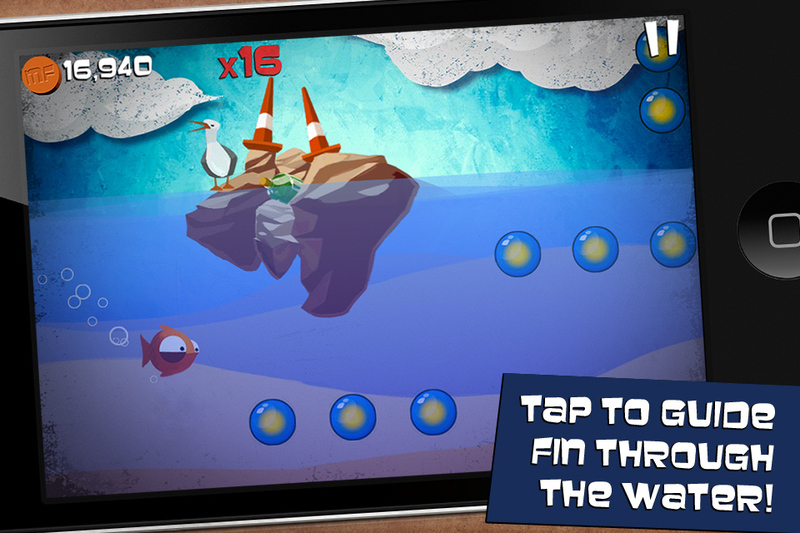 Mighty Fin’s light-heartedness is extended to its graphics and audio. Visually, the game is cartoony and might at first appear quite simple when actually it’s just very easy on the eye. The graphics are full of subtle nuances that add meat to the game’s bones. For example, Fin opens his mouth very slightly when he jumps out of the water. The game music bounces along quite happily, and never grates or feels repetitive. Similarly, sound effects pop and splash with endearing jollity. Despite all of this greatness, the game unfortunately comes with a few problems too. Although there are eight levels, the latter four levels use the same visual assets as the first four but are more difficult. There are thus essentially just four levels with two different difficulties each, rather than eight independent levels. This isn’t a major put-off, but is definitely annoying. The obstacles in levels could also be more varied – they tend to just be ‘jump over this or move out the way of it’ obstacles. It would be nice to see more lively dangers – perhaps a fish that chases Fin as he swims, or fishing nets that move back and forth through the water. Overall, Mighty Fin is a very enjoyable game that’s great value at just $0.99. It comes with a lot to do – there are 6 items to unlock per level, be they costumes or modes – and therefore a lot of incentive to replay the game. Leaderboards encourage you to struggle to get high scores, and the challenge of later levels makes them especially fun to tackle. The game is easily worth a download.